Is this person Spanish/Hispanic/Latino? Mark (X) the “No” box if not Spanish/Hispanic/Latino. [ ] Yes, other Spanish/Hispanic/Latino — Print group. What is this person’s race? Mark (X) one or more races to indicate what this person considers himself/herself to be. [ ] American Indian or Alaskan Native — Print name of enrolled or principal tribe. [ ] Other Asian — Print race. [ ] Other Pacific Islander — Print race below. When I was in high school, I remember being confused while filling out race information on standardized tests. The options have changed quite a bit since then, with more specific Asian options. The Latino category has become an ethnicity in addition to a race. Question: In what race category would you put Rosario? Not white, black or a specific American Indian tribe. I’m stumped. those categories are very confusing and offensive in a pigeon holey kind of way. but i’d definitely put rosario in the heart-breakingly stunning category. that part isn’t confusing at all. I hate those categories. They definitely stumped me. I wrote about this a few months ago after I had read a book on immigration and assimilation. The authors posited that Latinos who marked their race as white were probably more assimilated. I thought that was a stupid assumption. I marked “white” as a race reluctantly in the 2000 census because the other two options didn’t fit. I don’t tend to think of myself in racial terms, I’m more about ethnicity. For both of us, I decided to mark the “Mexican, Mexican Am., Chicano” and write in “HUMAN” under the option for another race. Definitely shoulda gone with Chamorro. It’s fun to say. everytime i see stuff like this i feel sick. i lived in spain for a few months and i was talking about this classification that the U.S. does. my friend who now lives in france didn’t understand. he thought the U.S. was sick. He said in Europe is forbidden to put people in racial classifications. people are people. you are spanish, french, german, italian..and so on. aren’t we american’s? i hope our nation will change…. I’d say she’s beautiful, nice picture…wait; what was the question? Oh yeah, what race? Who cares, she look like good folk, enjoy one another’s company and love one another for all your worth, that is what matters. South American, Indian(not American), Italian, and/or a combination of these. I am writing on this same subject of race categorization….the more I dig into American history the more I understand the anger of Black, and Indian Americans. I agree, we should all be called Americans. I like how the Europeans view the race issues, hopefully the West will catch on. Our classification of Rosario doesn’t matter. Rosario’s response matters. On the 2000 US Census, respondents marked one or more of the 5 enumerated races. She can mark more than one race if she is multiracial. 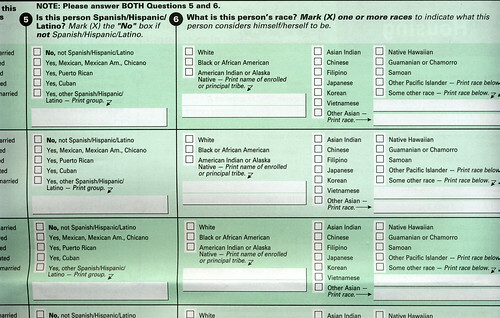 The 2000 US Census considers “Hispanic or Latino” to be an ethnicity which is separate from race. She may either respond that she is ethnically a “Hispanic or Latino” or ethnically “not Hispanic or Latino”. Here’s the thing, answers like “HUMAN RACE” are totally useless. That might be fine if we lived in a totally unbiased world that didn’t care about race and ethnicity but we all know that’s not true… I think tracking this is important. Without it, how could we fight racial diparities in education, wealth and opportunity? Plus, we’ve come a long way in now being able to mark multiple categories. It’s not perfect but it’s better than nothing. Yeah, yeah, yeah…whatever folks. Remember, this is America! If you don’t like it, go and live in some country where you don’t have to check a box dealing with race. There are both, bad and good things about having to choose. However, we all still live in the best damn nation in the world. Look in the mirrow and ask yourself, Why am I still living in America, if I’m that unhappy? The real issue is not about what RACE you check in a freaking box, rather how you treat every race of people you encounter daily. Open your ears and eyes, race and ethnic affilitation does matter…especially in America! Other countries have race relations and other issues too. Do yourself and others a kind favor, use your “freedom” of choice and check the little box and go take a chill pill and enjoy all the wonderful fruits of this great American nation! We are all very fortunate to be here… no matter who was in America first or still arriving. This is the planet Earth. We all must have clean air, fresh water to drink, safe food to eat, sunshine, clothing, shelter etc. Get it? It’s really not that bad. Be whatever race you choose…just demonstrate all the best that race has to offer and showcase it proudly before our kids so they can follow your lead.